Happy new year to you all! What an amazing year 2018 has been for the project, from the first spade in the ground last February to completion of the Medway renovations in November, so much has happened and we’ve been bowled over by everyone’s support. 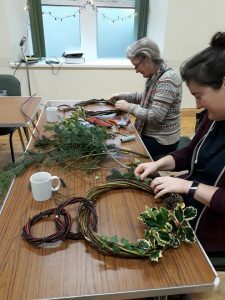 It’s hard for us to see the progress when we’re immersed in it from one day to the next, and at times it’s all just been a bit of a long slog, but having time to reflect on on all we have done with our volunteers over the year makes us really take it all in. So now after a wee break we’re back and ready to hit the ground running! 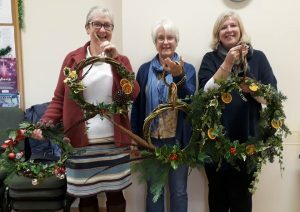 Before Christmas we ran another lovely wreath workshop at the hall in Catton, and the creations were gorgeous! 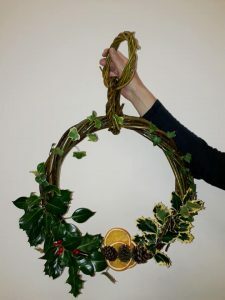 Everyone enjoyed themselves, learned a new skill and I hope the wreaths were all displayed proudly on their front doors. So what’s next, well things are starting to grow! 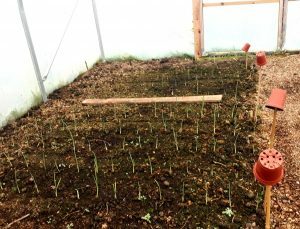 We planted some garlic, peas and beans in the poly-tunnel and they’re coming up nicely, and this morning I found my first snow drop of the year. 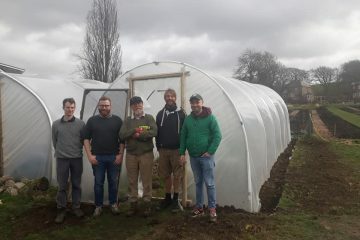 Sam is busy clearing the outdoor beds ready to plant as soon as the time is right, we’ve mulched the beds ready to plant in the Medway garden and we’re busy planning the timetable for the year. We are now open to referrals for those struggling with their mental health who could benefit from some exercise, support and fresh air. We have just taken on some new volunteers for our team. 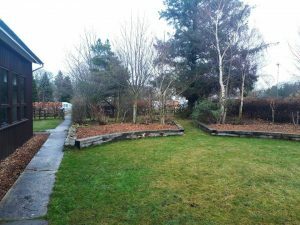 Please get in touch with us if you’d like to volunteer in the garden, we’re always looking for help. And without donations we wouldn’t be able to get started, if you’d like to help us just click on ‘contribute’ at the top, it all makes a difference.